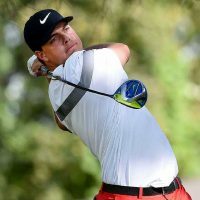 The Master’s is underway in Augusta, Georgia, and Baylor grad Keith Mitchell will be competing for the green jacket for the first time. He joins former Master Champion and fellow Baylor grad Jordan Spieth, as well as other notable names like Tiger Woods and Phil Mickelson. Mitchell hit a Double Bogie the 14th to get to +3, but he then came roaring back as he got an Eagle on 15 and a Birdie on 16. Here is a list of other notable scores as Keith finished his First Round at Even.